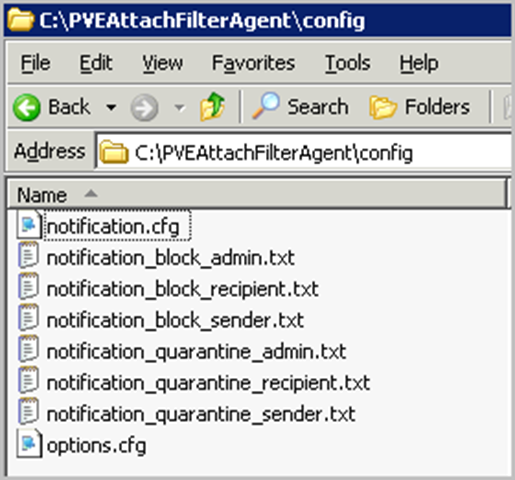 When messaging admins need to implement some sort of attachment filtering, they mostly think about antivirus products, or using transport rules in Exchange 2007. I have discovered that not a lot of antivirus products nor the Exchange 2007 built-in functionalities really allow a lot of flexibility when it comes down to filtering attachments based e.g. on attachment size. The tools that can perform this type of filtering may be too expensive for your budget. Big problem. Especially when you realize that some of the commercial tools have this feature available in earlier versions of Exchange, and Lotus Domino as well. I had a call with the support center of one of these vendors 2 days ago, and they told me that they simply cannot implement this because of Exchange 2007… Can you imagine this ? Anyways, they’ll probably fix it in the future, but I need the attachment filter today. Period. Anyways… to prove that they are wrong – no really, to fix my own problem (and perhaps your problem), for free, I decided to write my own Transport Agent for Exchange 2007. I wrote this tool over the weekend, so I have not been able to fully stress-test it, but it works just fine in my environment. 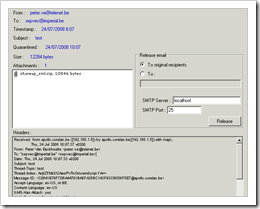 Update – April 2009 – The attachment filter works fine on Exchange 2010 as well. 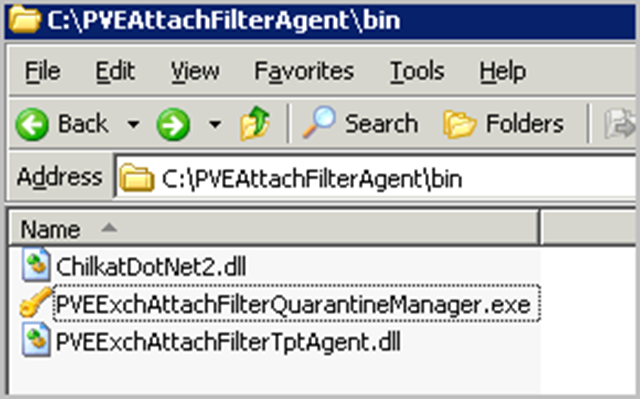 – PVEExchAttachFilterTptAgent.dll : this is the transport agent that will take care of the attachment filtering. Every email that is processed by this dll will be stamped by a custom header entry called “X-PVEExchAttachFilter”. Emails that already contain this header will not be processed by the Transport Agent. 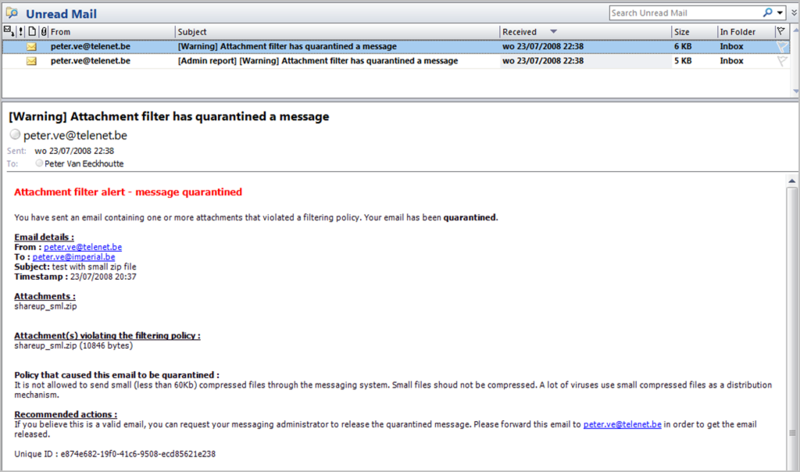 This ensures that we will be able to release emails from quarantine later on. Of course, this also introduces a security risk. After all, if someone decides to craft a custom email from the internet to your network, already containing this header, that email would not get processed. That is why I have written another transport agent called “PVEExchAttachFilterTptAgentCleanEdge” (see later). You can put that second Agent on your Edge servers. 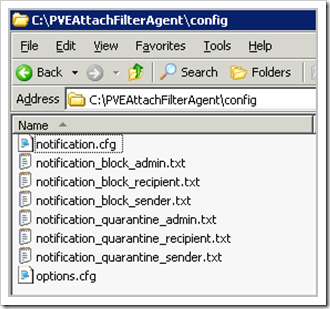 This agent will simply remove the X-PVEExchAttachFilter from all emails. These 2 dll’s should be placed on the HUB server. * PVEExchAttachFilterTptAgentCleanEdge.dll : this is the dll that will remove the custom X-header from all emails, and will stamp a new header called “X-PVEExchStrippedAttachFilterHeader” which is not used, but can be used by you in order to verify that the message has been processed by the agent. This dll should NOT be placed on the HUB server. This dll is only useful if you are using dedicated Edge servers. If you are using a third party internet smtp relay, you should investigate whether you can implement Header entry removal on this relay. This dll does not require any configurations or rules. It only removes the header and that’s it. This standalone tool must be placed on every HUB server that has the Transport Agent. Before you can start to use the tool, your have to set up your environment. The following steps and the sequence of these steps are very important, so follow the guidelines carefully ! This drive and folder structure are currently hardcoded in the application. I may change this in the future, but until that happens, you must adhere to this convention. 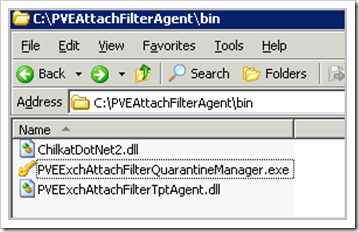 The PVEExchAttachFilterTptAgentCleanEdge.dll should not be placed on the HUB server. This file must be placed on the Edge server. It is recommended to create a similar directory structure on your Edge servers and put the PVEExchAttachFilterTptAgentCleanEdge.dll file in the \bin folder also. The rar file also contains a config folder. Extract the contents of this folder in the /config folder. The D:\PVEAttachFilterQuarantine folder should be empty too at this point. Note : these files are template files. If you are updating the tool to a newer version, do NOT extract/overwrite your own files with these files from the rar file. Otherwise, you will overwrite your own settings & templates with the default settings. All you need to do when updating is copying the new dll and exe files. Before configuring the options and rules, you will have to set some permissions on the folder structures. The MS Exchange Transport service runs as “Network Service”. 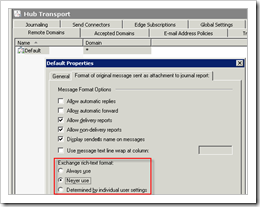 Because we will plug the TransportAgent into the MSExchangeTransport engine, “Network Service” needs to have full access to the folder structures. 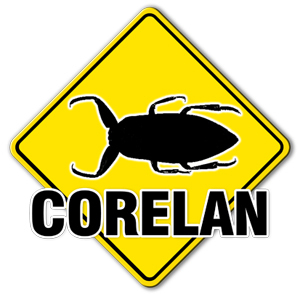 Edit the security permissions for the C:\PVEAttachFilterAgent folder and add Network Service, granting Full Control on this folder, all subfolders and all objects in the folders & subfolders. Before going on, verify that your folder structure is correct. Do not try to change your folderstructure, as this may break the application. 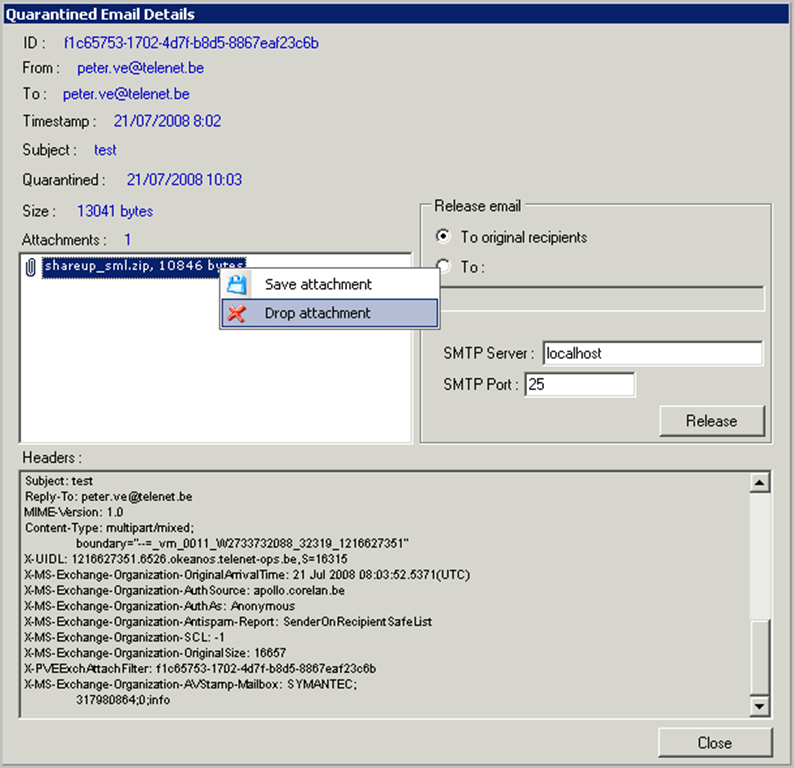 Change the quarantinefolder setting if you have created the Quarantine folder elsewhere. Change verboselogging to true if you want to create log files. There will be one log file per week. Logfiles older than 6 months old should get deleted automatically. Change the email addresses and internaldomains according to your environment. It is important to specify the internal domains, as this is a requirement for the tool in order to be able to distinguish internal and external senders and recipients. 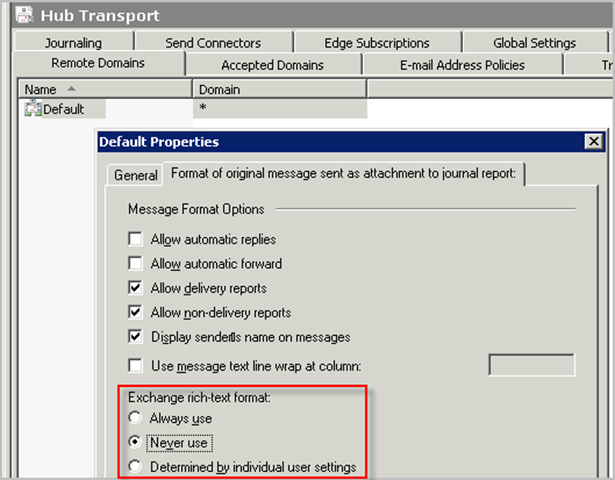 So if you have not defined internaldomains, the notification of external/internal senders and recipients will not work. – block : which will delete the mail from the queue. If you want to use the local HUB server to send the notification emails, make sure it accepts non-encrypted, anonymous connections for the local server. Otherwise, notification emails or quarantine releases won’t work. The config folder also contains some text files. The filename of these files are hardcoded in the application, so don’t change them. at the bottom, so don’t specify these tags yourself ! Edit the files to change the text and email addresses. You may notice that the template contains some variables, which will be converted to live data when a notification email is sent. compressed files as a distribution mechanism. description : this is a description of the rule. If you use the %policy variable in the notification templates, this is the text that will be displayed. Keep in mind – if you are using the %policy variable, this text will be part of the html body. So try to avoid using html tags in this text (such as <, > etc). If you still want to use those tags, make sure to URL encode them (> instead of > < instead of < etc). Just make sure to keep everyting on one line. filename : this indicates the filename of part of the filename to trigger a rule. If you don’t care about the filename, leave this empty. If you specify both a description and a filename, both parameters need to match in order to trigger the rule (AND operation). If you want to set up “OR” rule, you need to create multiple rules. minsize and maxsize can be used to look at specific sizes. You can set the minsize or maxsize to -1 if you don’t want to use one of the two sizes. Note : keep the fields and keywords in lower case ! You can create multiple rules. If multiple rules apply to the same attachment, the strongest one will win. 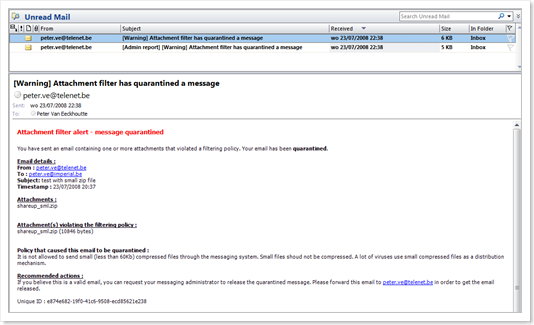 So if you have a rule that puts something in quarantine, and another rule that will block an email, and both rules apply to the same attachment, then the rule that blocks the email will win. Note : do NOT ever change config/notification/… or any other files while the agent is running. Stop the MSExchangeTransport service, make your changes, and start the service again. This is very important ! install-transportagent -Name "PVE Attachment Filter"
enable-transportagent -Id "PVE Attachment Filter"
Close the Exchange Management Shell and open event viewer. Make sure the service has started and does not throw any errors in the event log. If you see errors, make sure to verify the path structure, the permissions on all files and folders, and the contents of the configuration files. install-transportagent -Name "PVE Attachment Filter Header Cleaning"
enable-transportagent -Id "PVE Attachment Filter Header Cleaning"
Make sure the service has started and does not throw any errors in the event log. You can now start sending emails and see if your filter rules work. use small compressed files as a distribution mechanism. 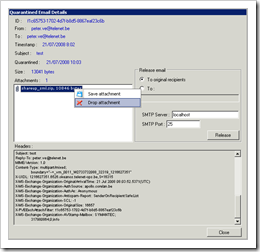 I have defined the notification config to notify the internal sender, and the administrator. My email account is also set as the admin email account, so I should get 2 emails when I sent out an email with an attachment that violates this rule. On the server, open the \bin folder, and launch the quarantine Manager. Either specify the guid in the Unique ID field, or just press the Load/Refresh button (assuming that the Quarantine path is set correctly) and you should see the quarantined email. When you release the email, the email will not being stopped again by the Transport Agent. Adiitionally, you can set Outlook Mail format options (globally and per email) to use HTML or plain text as the default as well. Thanks for share very good tool.